Click here to see the TI-Nspire CX CAS price on Amazon. If you’re heading into calculus, there’s a good chance you’re wrestling with the question of the TI-89 Titanium vs. the TI-Nspire CX CAS. They are the most popular Texas Instruments graphing calculators with that have the computer algebra system. I’ve used both of these calculators extensively with the math team I coach. If you need the Cliff Notes version, let me tell you that in the year 2012, the TI-Nspire CX CAS is the clear cut winner. For those of you who have the patience for a more detailed review, please read on. First off, you need to understand that both of these calculators feature a Computer Algebra System, or CAS. That means you can enter variables like x or y, and the calculator is capable of performing operations such as simplifying expressions or solving equations (think x + x = 2x). Of course, this is just the beginning, as the CAS can handle all kinds of algebraic manipulations from factoring to differential equations. While these features are awesome, you need to be careful when buying a CAS enabled calculator. They are not allowed on the ACT, although most models, including all versions of the TI-89 and TI-Nspire CAS models, are just fine for the SAT and AP tests. That makes these calculators a popular choice for calculus classes, but if you’re planning to take the ACT you may want to consider the non-CAS version of the Nspire CX. Why Choose the TI-89 Titanium Edition? The TI-89 has been around for a while, and the Titanium Edition is the latest version. Since it’s been on the market for many years, there are many programs and apps available for the device, a lot of which are available on the Texas Instruments website at no cost. When I originally wrote this article, the TI-89 Titanium had one big advantage over the TI-Nspire CAS–3D graphing. That’s no longer the case. Since TI-Nspire OS 3.0 was released, all TI-Nspire models are capable of 3D graphs, taking away the biggest advantage. In pretty much anything involving graphing at this point, the TI-Nspire CX CAS has the edge. More on that below. The TI-89 has a drop down menu system that I really like. It’s intuitive and easy to use. Apparently it’s been very popular because the menu system on the TI-Nspire CAS has a lot in common with it. A big drawback with the TI-89 is its lack of “mathprint” inputting, also known as pretty print. You can set the calculator up so that when you press enter, your work will be reformatted to look like what you see in the book. Unfortunately, you can’t do the inputs that way (see right). If you’re a calculus student, that’s probably not a big deal to you with exponents or radicals. However, when you’re learning summations and integrals, it is one more thing to worry about, and it can be hard to remember what each term in the list of inputs represents. Why Choose the TI-Nspire CX CAS? The TI-Nspire CAS had been on the market for just a few years when the TI-Nspire CX CAS was announced in early 2011. The CX is a color version of the TI-Nspire CAS. Like all versions of the TI-Nspire CAS, its menu system and command structure borrows heavily from the TI-89. The TI-Nspire CX CAS has a lot of advantages over the TI-89, especially with inputting expressions and graphing. In terms of inputting expressions, there are templates for summations, integrals, and just about anything else you’d encounter in calculus (see screen shot below). With graphing, I love the fact that there are fewer commands to learn in order to find extrema and intercepts. All you have to do is use the trace feature and the Nspire CX CAS will “lock in” on those important points. Considering how often you need to find those points in a calculus class, this is a big advantage. With the release of TI-Nspire 3.2 in June of 2012, even more graphing features were added. 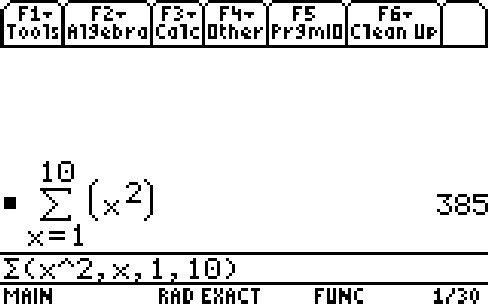 The TI-Nspire CX CAS can now graph equations in “x=” form. It also has the ability to graph conic sections and solve for points of interest on those conic sections. At one point, there was also the concern by some calculus students that the TI-Nspire CX CAS was missing differential equations capabilities. Those abilities have been added to all TI-Nspire CAS versions, so this is no longer an issue. 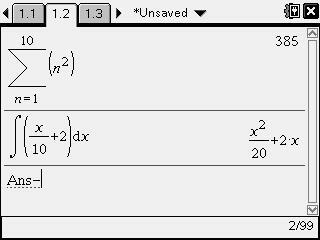 However, since the TI-89 Titanium is older and more of a programmer friendly calculator, you may find that there are calculus apps/programs available for it that are not available for the TI-Nspire CX CAS. For teachers, the TI-Nspire CAS series has dynamic capabilities that can’t be matched by any other graphing calculator. As a simple example, on one screen you can have a graph, its equation, and its table. Use the point and click touchpad to drag the graph into another shape, and the equation and table will adjust in sync. The applications of this kind of interconnectedness between data representations are endless. Generally speaking, the TI-Nspire CX CAS is just plain better as a learning device in virtually every way. In addition to simplifying inputs of equations and algebraic commands, it also has geometry software, notes features, and spreadsheet capabilities the TI-89 Titanium can’t touch. As much as I love both of these calculators, in a head to head battle, I’ve got to recommend picking up a TI-Nspire CX CAS. I went with the Nspire CAS for my math team and have found it to be a great decision. We won the Illinois state math team championship this past spring, and I definitely attribute some of our success to the CAS. It’s got all of the latest bells and whistles, a much better display, and I find it much, much easier to use than the TI-89 Titanium (and so do my students that use it every day), mainly due to its graphing interface and math print inputting. Now that Texas Instruments has given differential equations, 3D graphing, and color capabilities to the TI-Nspire CX CAS, it’s taken the series to a whole new level. I’m really only scratching the surface of what the TI-Nspire CX CAS can do in this review. If you have any trouble getting started with your CAS, check out my book TI-Nspire Tutorials Vol 2: Using CAS Features like a Champion. You can learn the same techniques I use with my math team students on the CAS.